What lucky sheep who graze on the National Trust’s land at the Lots in Silverdale! The views across to Grange and the Lakeland hills are stunning. They probably appreciate the free draining limestone soil more than the views though, since they can happily munch away without getting soggy feet. Come spring, and time for shearing, what do you think happens with the fleece? In years gone by, you’d assume it would be used for knitting and insulation in local homes. But now? You might assume (sadly) that fast fashion would have pushed the value down so much it would just go to waste. But not so! Local textile artist Kate Schofield buys the fleeces from farmer Martin Fishwick to create beautiful traditional ganseys (fishermen’s jumpers) and handwoven tweed. Kate learnt to sew and knit when she was a girl and has worked with textiles ever since. Her interest in linking grower, maker and buyer began in the 1980s while on holiday in the Lake District. The National Trust were doing a project with the fleece from local Herdwick sheep. Kate got involved and her desire to make traditional northern garments from local sheep breeds grew from there. ‘Working with the Bowland farmers was a fantastic opportunity’, says Kate, ‘The amount of knowledge needed to farm sheep is huge, but the rewards are small.’ With this in mind, Kate ensures that the rate she pays her suppliers for their fleeces is fair. Kate’s link with Arnside & Silverdale developed as she was working with the National Trust, who put her in touch with Bill Grayson, from whom she buys Hebridean sheep fleeces, and National Trust tenant farmer of the Lots, Martin Fishwick. She now also buys white faced woodland sheep fleeces from Saltcotes Farm, and fleeces from Joan Jackson in the AONB. Some of the fleeces Kate processes herself, carding and handspinning them, which she says is very therapeutic. Mostly she sends the fleeces to one of three small mills in the UK which take small commissions from individual makers. 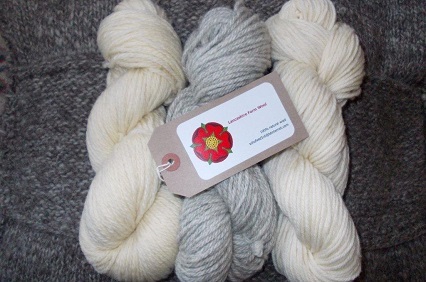 Kate prefers natural, sheep-coloured yarn, but also hand dyes a small amount of her wool in coastal colours, mirroring the landscape where it grew up. Kate is hoping now to find a suitable studio space in the AONB where she can work and hold open studio events. She will be displaying some of her work as part of the Silverdale and Arnside Arts and Crafts Trail.